I enjoy Halloween, almost as much as my kids. I dress up and hand out candy, and I add a few simple decorations to my home. I really like to focus on my front porch the day of trick or treating and create a fun slightly scary place for kids to come and get some candy. This year I made a Halloween sign that will hang on my door next to the giant bowl of candy and a few pumpkin lights. 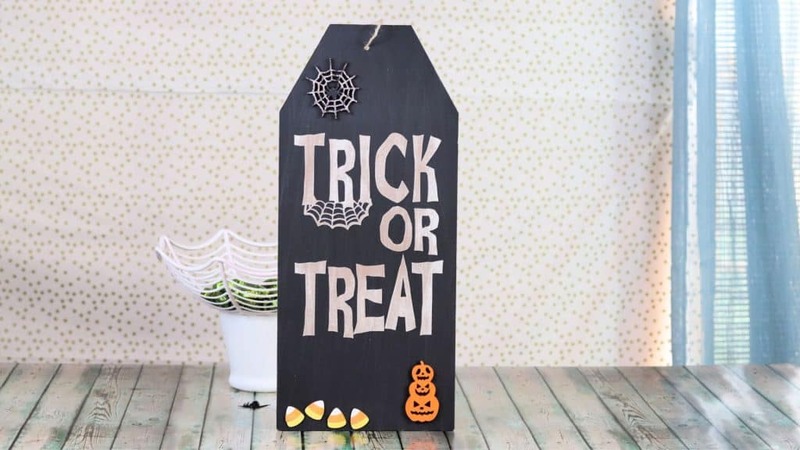 I’ve included a Silhouette cut file for you in this post so you can make your own Halloween sign for trick or treat. Get all the details below and be sure to watch the video to see how easy this is to make. Today’s post is part of the Remodelaholic Halloween Decor Challenge! The YouTube playlist above is packed full of creative Halloween decor ideas you will want to watch, save and recreate. I picked up most of these supplies at JoAnn but you can find similar items on Amazon, my shop page has all my go to craft supplies. 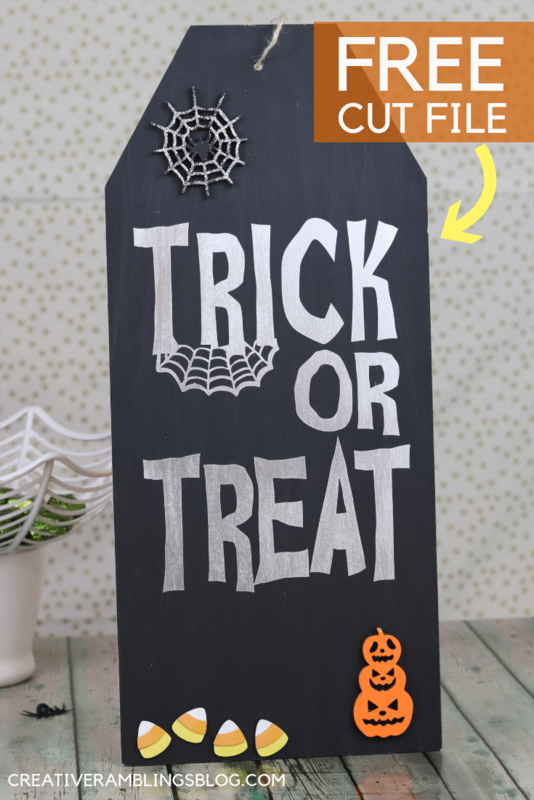 A few tips for making a painted Halloween sign and using a stencil. Always wait for your base layer of paint to dry before applying the stencil. You can speed this up with a blow dryer but I like to let it sit for a few hours to dry on its own. Once the paint is dry I like to lightly sand it with fine sandpaper which helps the stencil stick really well. Cut out the stencil using your Silhouette, be sure to watch my 3 favorite ways to stencil a sign, and transfer it to the sign using transfer tape or contact paper. Spray a single coat of chrome spray paint, allow it to dry for just a minute or 2, then pull off the stencil to reveal crisp lines and metallic letters. I added a painted spider web and jack o lantern along with a few candy corn stickers. This is the perfect Halloween sign for my front door and trick or treating. 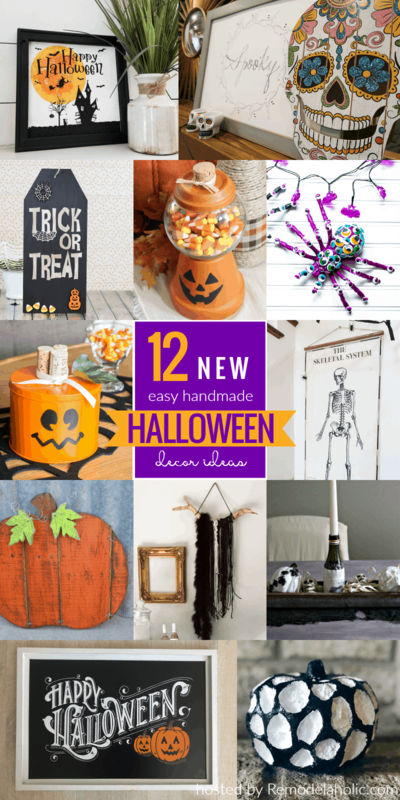 Now take a look at these other Halloween decor projects! Love this project! Am not into scary Halloween at all – this is so cute. Thank you for sharing! This is such a great Halloween sign. Thank you for the free svg!